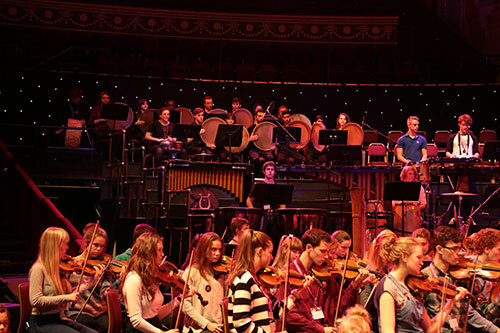 Students from the Department of Music at City University London recently performed at the Royal Albert Hall as part of the Music for Youth Proms. City's Middle Eastern Music Ensemble joined 100 young players from the Cornwall Youth Orchestra, 47 junior violinists from Cornwall and Northamptonshire and four narrators. They performed Prince Zal and the Simorgh, a piece for orchestra and Iranian instruments composed by David Bruce in 2012 and commissioned by City University London and the London Philharmonic Orchestra as part of a larger outreach project. The project, which introduced young people to Iranian music and culture, grew out of Dr Laudan Nooshin's enthnomusicological research, which has facilitated access to and understanding of Iranian art and culture in Britain and around the world. Watch a video about the project here. Dr Nooshin explained the piece is based on a story from the Iranian epic poem Shahnameh (The Book of Kings), which was written around 1,000 years ago by Abolqasem Ferdowsi (940-1020). She said: “With its many topical themes of tolerance and forgiveness, this story proved a wonderfully rich source for use with British youth. "In particular, the piece offers a more positive image and understanding of Iran – its people, culture and history – to the young people performing and hearing it than they might normally experience through the media and other kinds of representation." A chance discussion led to Prince Zal being chosen by Cornwall Youth Orchestra for a performance at the National Festival of Music for Youth in Birmingham in July 2015, following which the piece was selected for the Youth Proms at the Royal Albert Hall. 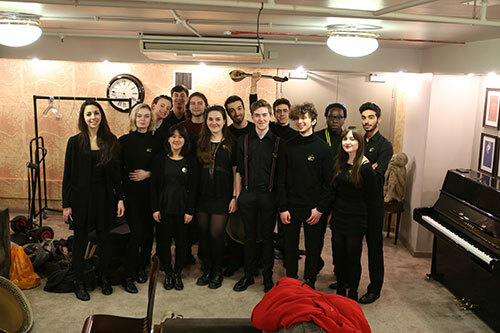 The orchestra was joined by members of City’s Middle Eastern Music Ensemble who played various Iranian percussion instruments, with first year Music BMus student Antonios Rousounelos as soloist. Music for Youth is a national music education charity providing free access to performance and audience opportunities for young musicians across the UK. The charity's proms saw 3,000 of the country's brightest young musicians take to the stage over three nights at the Royal Albert Hall, between 23rd and 25th November, 2015. For more updates on the Department of Music, read its blog or visit its website.